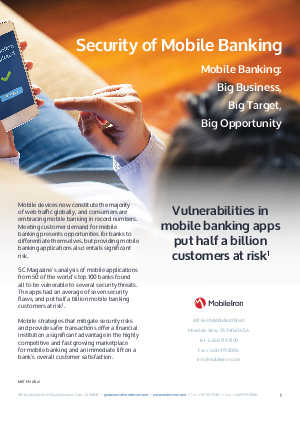 SC Magazine’s analysis of mobile applications from 50 of the world’s top 100 banks found all to be vulnerable to several security threats. The apps had an average of seven security flaws, and put half a billion mobile banking customers at risk. Mobile strategies that mitigate security risks and provide safer transactions offer a financial institution a significant advantage in the highly competitive and fast growing marketplace for mobile banking and an immediate lift on a bank’s overall customer satisfaction.